Infrared radiation exists in the electromagnetic spectrum at a wavelength that is longer than visible light. It cannot be seen but it can be detected. Objects that generate heat also generate infrared radiation and those objects include animals and the human body whose radiation is strongest at a wavelength of 9.4um. Infrared in this range will not pass through many types of material that pass visible light such as ordinary window glass and plastic. However it will pass through, with some attenuation, material that is opaque to visible light such as germanium and silicon. An unprocessed silicon wafer makes a good IR window in a weatherproof enclosure for outdoor use. It also provides additional filtering for light in the visible range. The pyroelectric sensor is made of a crystalline material that generates a surface electric charge when exposed to heat in the form of infrared radiation. When the amount of radiation striking the crystal changes, the amount of charge also changes and can then be measured with a sensitive FET device built into the sensor. The sensor elements are sensitive to radiation over a wide range so a filter window is added to the TO5 package to limit detectable radiation to the 8 to 14mm range which is most sensitive to human body radiation. Typically, the FET source terminal pin 2 connects through a pulldown resistor of about 100 K to ground and feeds into a two stage amplifier having signal conditioning circuits. 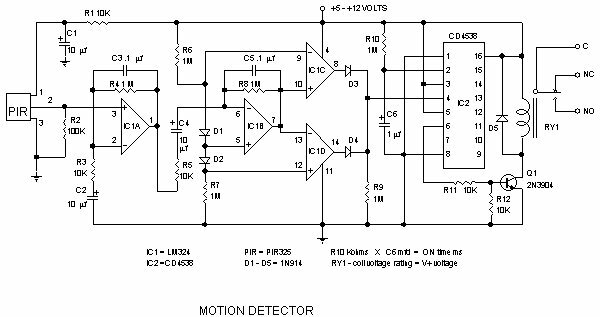 The amplifier is typically bandwidth limited to below 10Hz to reject high frequency noise and is followed by a window comparator that responds to both the positive and negative transitions of the sensor output signal. A well filtered power source of from 3 to 15 volts should be connected to the FET drain terminal pin 1. The figure below shows the PIR electrical specifications and layout in its TO5 package. Note the wide viewing angle without an external lens. This is a typical application circuit that drives a relay. R10 and C6 adjust the amount of time that RY1 remains energized after motion is detected. Download PDF drawing. 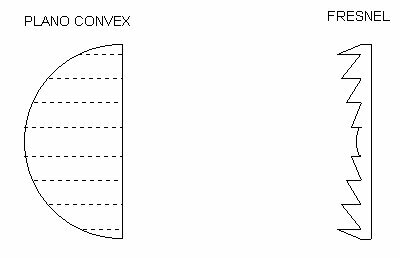 A Fresnel lens (pronounced Frennel) is a Plano Convex lens that has been collapsed on itself to form a flat lens that retains its optical characteristics but is much smaller in thickness and therefore has less absorption losses. 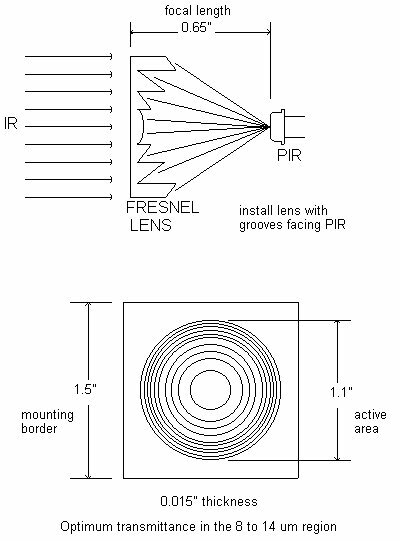 Our FL65 Fresnel lens is made of an infrared transmitting material that has an IR transmission range of 8 to 14um which is most sensitive to human body radiation. It is designed to have its grooves facing the IR sensing element so that a smooth surface is presented to the subject side of the lens which is usually the outside of an enclosure that houses the sensor. The lens element is round with a diameter of 1 inch and has a flange that is 1.5 inches square. This flange is used for mounting the lens in a suitable frame or enclosure. Mounting can best and most easily be done with strips of Scotch tape. Silicone rubber can also be used if it overlaps the edges to form a captive mount. There is no known adhesive that will bond to the lens material. The FL65 has a focal length of 0.65 inches from the lens to the sensing element. It has been determined by experiment to have a field of view of approximately 10 degrees when used with a PIR325 Pyroelectric sensor. This relatively inexpensive and easy to use Pyroelectric Sensor and Fresnel Lens can be used in a variety of science projects, robots and other useful devices.